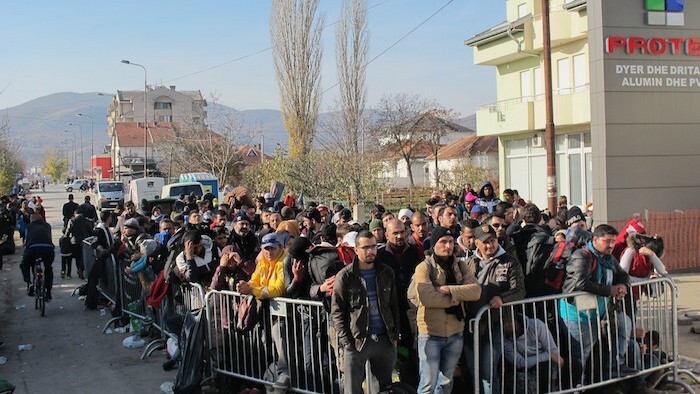 Refugees: Economic Burden or Opportunity? How many refugees can a nation afford? The ongoing plight of refugees in Europe divides opinion like few other contemporary debates, being interwoven with competing narratives of nationalism, compassion, religion, identity, and terrorism. The question of how many refugees each nation should accept, or the extent to which each nation’s borders should be open or closed, becomes mired in intractable positions within these narratives. Leaving aside overtly racist positions, the mainstream debate essentially revolves around how many refugees each nation can “afford”. On the one hand, it is argued that relatively wealthy countries can easily afford to accommodate fairly large numbers of refugees. Yes, there is a cost, according to this view, but cost considerations should be less important than humanitarian objectives. This position is underpinned by values of compassion and care, and by obligations under international treaties. It draws institutional strength from Article 14 of The Universal Declaration of Human Rights: “Everyone has the right to seek and to enjoy in other countries asylum from persecution” (United Nations, 1948). Let us call this the humanitarian stance. On the other hand, there are those who argue that refugees cause harm to their host nations, mainly by draining state resources. This position is typically underpinned by an ambivalence towards foreign cultures, and its advocates might refer to threats to national and cultural identity, and to community safety, posed by some unfamiliar group of people. Let us call this the nationalist stance. While the humanitarian stance principally relies on moral arguments, the nationalist stance relies substantially on economic arguments. Perhaps knowing that nationalist arguments per se would invite accusations of xenophobia or racism, advocates of the nationalist stance use the language of economics to make their case. This may be because such language appears less value-laden, or more neutral, than the language of nationhood and cultural identity. This nexus between nationalist sentiment and economic rationalisation is a delicate one. To illustrate, Australian media columnist Paul Sheehan (2015) speaks of “the Arab Muslim world, which is now exporting its failures”, while basing his argument on accepting one million refugees at the supposed cost to Europe of “roughly $60 billion”. He cites no source for this figure. In contrast, advocates of the humanitarian stance rely on the force of value-based arguments, rather than engaging in an economic debate which they suspect they may not win. For example, 126 leading economists recently signed an open letter to UK Prime Minister David Cameron, arguing that “it is morally unacceptable for the UK not to play a fuller part in taking in refugees” (Kollewe, 2016). In terms of philosophical ethics, the humanitarian stance is clearly deontological, whereas the nationalist stance adopts a more consequentialist focus on relative costs and benefits. For humanitarian advocates, any reference to economic consequences might be framed as a duty to “share the burden”, a phrase used by Angela Merkel to appeal to other European countries to join Germany in accommodating Syrian refugees (Paterson, 2015). What both positions have in common is an assumption that refugees present an economic burden. Indeed, it is widely assumed that refugees take more than they give, and that skilled workers make a bigger contribution (Boese, 2009; Stevenson, 2005). The nationalist stance explicitly frames refugees as a burden on host countries, assuming them to represent an unaffordable cost to the nation’s purse. The humanitarian stance, meanwhile, is willing to accept the economic burden on the basis of a perceived moral obligation. However, do refugees really present an economic burden, or could they offer an economic opportunity to host nations? “We are ready to work and pay taxes… I don’t want to be a burden. I want to be part of the community” (Amir, an Iraqi asylum seeker, quoted by Morton, 2013). In 2013, I conducted a metareview of the literature on the economic impact of refugees (Parsons, 2013). The study focused on Australia, and also drew on some studies from the UK, the EU, Canada, and the USA. The principal objectives of the metareview were to reach a clearer understanding of the economic impacts of refugees, and to understand how methods of impact assessment influence findings. Following are some of the key points from that review, with some later insights added. A recent article for The Conversation (Hartley and Fleay, 2016) investigated claims about the “cost” of refugees in Australia. The authors, as well as two reviewers, concluded that some claims exaggerated the cost while others could not be verified. Clearly, any consideration of economic impact needs to pay close attention to the assumptions and definitions used to derive findings. If we are to make an informed judgement about the economic impact of refugees on host nations, a fundamental prerequisite is a comprehensive and agreed method of assessing “impact”. Yet one of the key findings of the metareview was that studies are highly varied in what impacts they include and exclude, and the methods they use to measure those impacts. This leads to three significant challenges in assessing the economic impact of refugees. Much research on the economic impact of refugee settlement tends to subsume refugees within broader research on migrants (RCOA, 2010). Research relating specifically to refugees is sparse. The only substantial study (Hugo, 2011) that distinguished between refugees and other migrants did so by using country of origin as a proxy indicator. Challenge 2: What is “Economic”? The term “economic” may have relatively broad or narrow definitions. Studies that use narrow definitions conceptualise economic impact in exclusively quantifiable ways, such as comparing tax revenues with health and social security expenditures. Studies that use broader definitions conceptualise economic impact not only in these financial terms, but also in terms of unpaid work, contributions to social and community capital, filling labour market niches, sending remittances to families and communities overseas, and supporting Australia’s development assistance to low-income countries (e.g., Hugo, 2011). Since some of these broader impacts are difficult to measure, such studies cannot easily be compared with narrow, quantitative studies. But even quantitative studies do not necessarily always measure the same thing. As Cully (2012) explains, calculation of impact depends on the accounting method used, whether direct accounting or net present value. More generally, varying conceptualisations of “economic” inevitably lead to inconsistent conclusions about overall impact. While policy-makers must inevitably deal with the short-term consequences of immigration decisions, the real impacts unfold over generations (Liebig, 2006). Hugo, Khoo, and McDonald (2006) argue that many migrants are substantially motivated to move not so much for their own benefit but for that of their children. According to Carrington, McIntosh, and Walmsley (2007), many of the benefits of migration accrue to the second generation, whereas the first generation tends to bear the costs. In this context, an assessment timescale of anything less than 20 years is telling only a partial story. Hugo (2011), therefore, investigates the contributions of first and second generation humanitarian entrants in Australia. Yet among the quantitative models reviewed, timescales used to assess impact varied from five to 20 years. Not surprisingly, the choice of timescale significantly influences findings; studies using shorter timescales find that refugees present a net cost, while those using longer timescales generally find a net contribution. Together, these three challenges highlight the care required when interpreting the findings of any study on economic impact of refugees. Notwithstanding these challenges, what do various studies tell us about this impact? Australia settled over 700,000 refugees from 1945-2011 (Hugo, 2011), and around 60,000 more from 2011-2015 (DIBP, 2016). A common assumption about refugees, as noted above, is that they take more than they give. Comparing various migrant categories, the Australian Bureau of Statistics (2004) found that 43% of migrants on humanitarian visas received their main source of income from wages or salary, compared with 39% from a government pension or allowance. The comparable figures for skilled migrants are 70% and 6% respectively, and for all migrants 58% and 16% respectively. This suggests that refugees are disproportionately reliant on government benefits. However, the Productivity Commission (2006) notes that dependency diminishes ten years after arrival, and that some other migrant groups have higher dependency rates than humanitarian migrants after 20 years. The Migrants Fiscal Impact Model, commissioned by the Australian Government, compares economic impact of various migrant categories. The 2001 model (Access Economics, 2001) projected that, for humanitarian migrants, expenses would still outweigh revenues after ten years. For family migrants, in comparison, revenues would outweigh expenses from year six, and for skilled migrants, from year one. The 2008 model (Access Economics, 2008) found that the contribution for refugees eventually becomes positive after 12 years. By way of comparison, RCOA (Refugee Council of Australia, 2010, p. 9) found that the net economic impact of refugees is positive after about a decade. Stevenson (2005), meanwhile, claims that refugees make a positive contribution to the economy within five years of arrival, although he does not explain the methodology used to arrive at this figure. While these models differ in their details, they all indicate that refugees do make a net economic contribution, but that this contribution is on average lower than that of other migrant categories, at least over the timescales typically projected. Other studies show, in early stages of settlement, refugees experience higher unemployment and lower workforce participation than other migrants, owing to a variety of structural barriers. These barriers include: having to learn a new language; low levels of literacy and education; qualifications not being recognised; and lack of local workplace knowledge and experience (Hugo, 2011; Koleth, 2009; MDA, 2011-2012; O’Dwyer, 2011). Some of these barriers, particularly those related to language and literacy, may present a lesser economic obstacle to current refugee groups, such as those from Syria, Iran and Iraq, than they did to some earlier refugee groups, potentially accelerating economic contribution. Refugees face substantial obstacles to employment in the early stages of settlement, but can be highly successful in the long term. The proportion of refugees receiving their main income from their own business is significantly higher than that for other migrant categories. This suggests a high propensity towards entrepreneurship, perhaps owing to general resilience and resourcefulness. This finding is repeated elsewhere (e.g., ABS, 2015). Refugees are adept at filling labour market niches that are not filled by other migrant groups. Refugees play a significant role in establishing development and trade linkages with origin countries. The last point hints at the impact of refugees sending remittances to their countries of origin (see also Njuki, 2009; O’Dwyer, 2011). Provost (2013) notes that some developing countries receive more in remittance money than they do in aid. For some countries, she finds, remittances are a substantial proportion of GDP – for example, 47% in Tajikistan and 31% in Liberia. However, the net impact on host countries of refugees sending remittances overseas is unclear. In addition to these broad assessments, some studies examine the economic impact of refugees at a local level. Stilwell (2003), for example, states that Afghan settlers in Young, New South Wales, contributed over $2.4 million from mid-2001 to 2003. Carrington et al. (2007) found that refugees tend to enhance economic prosperity and diversity in regional towns. Refugees are more willing than others to relocate to obtain employment, will accept jobs that many other Australians would reject, and have high retention rates with employers (Brima, 2013; MDA, 2012a). Other studies focus on the economic impact of voluntary work among refugees. Volunteering forms a key part of the integration process for many refugees (Hugo, 2011; MDA, 2012b; O’Dwyer, 2011; RCOA, 2010). While it may be principally a social and/or civic activity, it has an economic dimension because it may constitute a proxy for financial transactions. However, its informal nature makes it difficult to quantify. In summary, we can draw two conclusions from these Australian studies. Firstly, taking quantitative indicators alone, the net economic impact of refugee settlement on host countries appears to be positive, though it may take some years for this to eventuate. Secondly, refugees provide various other positive – but unquantifiable – economic impacts that are not provided by other migrant groups. Importantly, no study indicates that refugees impose an economic burden over the long term. The studies reviewed so far focus on Australia. While other countries may have similar experiences, different contexts may produce different outcomes. In particular, it is not clear whether larger number of refugees, such as those fleeing Syria for northern Europe, would lead to different economic impacts. However, some research has been conducted in countries with larger numbers of refugees. In the UK, migrants contributed £2.5bn more in taxes than they received in benefits and services in 1999-2000 (Gott and Johnston, 2002). A study of 19 countries in the EU, covering the period 1993-2008, found no statistically significant evidence for the idea that relatively generous unemployment benefits encourage migration (Giulietti et al., 2011). In Canada, most empirical studies have found that “immigration has little or no impact on domestic labour markets and government fiscal balance” (Nadeau, 2011). Also in Canada, from 1980-2001, employed refugees earned an income equal to that of family migrants (DeVoretz, Pivnenko, and Beiser, 2005). In the USA, “undocumented immigrants” have a net positive impact at the national level (Nadadur, 2009). In the context specifically of the current wave of refugees in Europe, additional spending could boost aggregate demand in Europe by about 0.1-0.2% of GDP in 2016 and 2017 (OECD, 2015). Again, the notion of refugees as an economic burden appears to be a myth. Notwithstanding the examples of Jordan, Lebanon and Turkey, which are currently accommodating the majority of Syrian refugees, there is no obvious reason to suppose that significantly larger numbers would change these findings. It is likely that the short-term budgetary cost to host nations would be proportionately bigger, but it is equally likely that the long-term economic benefits would be proportionately bigger. The economic question, then, is whether nations are prepared to accept the short-term budgetary costs to realise the opportunity of longer-term gains. Perhaps the most useful insight into larger numbers might come from Sweden, the European country with most refugees per capita. Ruist (2016) estimates that refugees, who constitute 5.1% of Sweden’s population, accounted for 5.6% of total public spending and 3.4% of total public revenue in 2007. In other words, public spending on refugees is broadly in line with the rest of the population, but their contribution in taxation was somewhat lower than the population average. Drawing implications for other countries, Ruist argues that the net impact is likely to be more positive, owing to the sparsity of employment opportunities for newly arrived refugees in Sweden coupled with that country’s relatively generous welfare system. Since the shift from being net recipients to net contributors depends on finding work and paying taxes, policies that facilitate economic integration will enhance and accelerate the contribution that refugees can make. The Australian Government’s policy of denying asylum-seekers the right to work and forcing them to rely on welfare payments is, in this sense, counterproductive. The sooner refugees can earn an income and pay taxes, the sooner they become net economic contributors. Policies to assist paths to employment and self-employment include easing restrictions on geographical mobility, and facilitating access to capital (Aiyar et al., 2016; Matsangou, 2015). However, apparently rational approaches have become extraordinarily elusive recently. Refugee policy has become so politically sensitive that, as Malik (2016) notes, moral, workable solutions have become difficult to achieve democratically. Yet in this arena, public attitudes appear to be disproportionately influenced by emotion rather than fact. As Malik also explains, while popular opinion is that refugees are “flooding” into Europe, in 2015 the number of refugees arriving was around 0.1% of the EU population. Mainstream debate, whether from a humanitarian or nationalist point of view, assumes that refugees impose a net burden on their host countries. But empirical evidence suggests that refugees actually contribute economically to their host countries, even if this takes some years to achieve. The only sense in which refugees could be framed as a “burden” or “cost”, therefore, is if one takes a strictly narrow, quantitative conceptualisation of “economic” and a very short-term view of life. In reality, firstly, economic impacts cannot be fully understood merely in tax and revenue terms. Secondly, it is more meaningful to evaluate someone’s economic impact when they have had the opportunity to overcome barriers to reaching their full potential. From a broader, longer-term understanding, those taking a humanitarian stance could confidently use economic arguments to complement their values-based position. Further work is needed to develop an analytical framework that incorporates these broader, longer-term dimensions (Zetter, 2012). Meanwhile, if it were to become common knowledge that refugees really give more than they take, or if refugee settlement were framed as an opportunity, the notion of “sharing the burden” would become illogical, the question of “affordability” would become redundant, and a moral refugee policy could be both democratic and workable. Access Economics (2008). Migrants Fiscal Impact Model: 2008 update. Report for the Department of Immigration and Citizenship. https://www.immi.gov.au/media/publications/research/_pdf/migrants-fiscal-impact-april-2008.pdf. Access Economics (2001). Impact of migrants on the Commonwealth budget. Summary report – 2000-01 update, Report for the Department of Immigration and Multicultural Affairs. https://www.immi.gov.au/media/research/projects/economic/fiscal-impact.htm. Australian Bureau of Statistics (2015, 4th September). “Media release: Humanitarian migrants the most entrepreneurial.” https://www.abs.gov.au/AUSSTATS/abs@.nsf/Previousproducts/3418.0Media%20Release12009-10. Australian Government Department of Immigration and Border Protection (DIBP) (2016.) “Fact sheet – Australia’s Refugee and Humanitarian programme.” https://www.border.gov.au/about/corporate/information/fact-sheets/60refugee. Brima, Edward (2013). “How refugees stimulate the economy”. http://www.latrobe.edu.au/news/articles/2013/opinion/how-refugees-stimulate-the-economy. Carrington, Kerry, Alison McIntosh, and Jim Walmsley (Eds) (2007). The social costs and benefits of migration into Australia. Canberra: Commonwealth of Australia. https://www.immi.gov.au/media/publications/research/social-costs-benefits/. Cully, Mark (2012). More than additions to population: The economic and fiscal impact of immigration, Intergen +10: 10th Anniversary of the Treasury’s Intergenerational Report, Melbourne Institute, 11th May. https://www.immi.gov.au/media/publications/research/_pdf/economic-fiscal-impact-of-immigration.pdf. DeVoretz, Don, Sergiy Pivnenko, and Morton Beiser (2004, March). “The economic experiences of refugees in Canada.” IZA Discussion Paper No. 1088. https://ftp.iza.org/dp1088.pdf. Giulietti, Corrado, Martin Guzi, Martin Kahanec, and Klaus F. Zimmermann (2011, October). “Unemployment benefits and immigration: Evidence from the EU,” IZA Discussion Paper No. 6075. https://ftp.iza.org/dp6075.pdf. Gott, Ceri and Karl Johnston (2002). The Migrant Population in the UK: Fiscal Effects. Occasional Paper No. 77. London: Home Office Research, Development and Statistics Directorate. https://webarchive.nationalarchives.gov.uk/20130128103514/http://www.homeoffice.gov.uk/rds/pdfs/occ77migrant.pdf. Hartley, Lisa and Caroline Fleay (2016, 15th February). “FactCheck Q&A: do refugees cost Australia $100m a year in welfare, with an unemployment rate of 97%?” The Conversation. https://theconversation.com/factcheck-qanda-do-refugees-cost-australia-100m-a-year-in-welfare-with-an-unemployment-rate-of-97-54395? Hugo, Graeme (2011). Economic, social and civic contributions of first and second generation humanitarian entrants. Report for the Department of Immigration and Citizenship. Hugo, Graeme J., Siew-Ean Khoo, and Peter McDonald (2006). “Attracting skilled migrants to regional areas: What does it take?” People and Place, 14(3), pp. 25-36. Koleth, Elsa (2009). Employment issues for culturally and linguistically diverse (CALD) people. Client memorandum to Senator Moore, 22 December. Kollewe, Julia (2016, 1st February). “Economists to Cameron: refugee crisis response ‘morally unacceptable’”, The Guardian. http://www.theguardian.com/world/2016/feb/01/economists-david-cameron-open-letter-refugee-crisis-response-morally-unacceptable. Liebig, Thomas (2006). The labour market integration of immigrants in Australia. OECD social, employment and migration working papers, no. 49. https://www.oecd-ilibrary.org/social-issues-migration-health/the-labour-market-integration-of-immigrants-in-australia_235260166224. Malik, Kenan (2016, 5th February). “Europe is in a bind over its refugee problem,” The Guardian Weekly, p. 18. Matsangou, Elizabeth (2015). “Refugees are an economic benefit, not burden, to Europe,” World Finance. https://www.worldfinance.com/infrastructure-investment/government-policy/refugees-are-an-economic-benefit-not-burden-to-europe. Morton, Rick (2013, 22nd January). “Being a burden on society doesn’t work for Amir”, The Australian, pp. 1-2. Multicultural Development Association Inc. (MDA) (2012a). Settlement works: Stories from Rockhampton. https://www.mdainc.org.au/sites/default/files/Settlement%20Works.pdf. Multicultural Development Association Inc. (MDA) (2012b). The power of 10. https://www.mdainc.org.au/sites/default/files/Power_of_10_.pdf. Multicultural Development Association Inc. (MDA) (2011-2012). Annual report. https://www.mdainc.org.au/sites/default/files/mda_annual_report_2012.pdf. Nadadur, Ramanujan (2009). “Illegal Immigration: A positive economic contribution to the United States”, Journal of Ethnic and Migration Studies, 35(6), pp. 1037-1052. Nadeau, Serge (2011, 20th May). “The economic contribution of immigration in Canada – Recent developments. What do we know? What does it mean for policy?” https://www.socialsciences.uottawa.ca/grei-rgei/eng/documents/Synthesis_wp_000.pdf. Njuki, Patricia (2009). Longitudinal study of newly arrived migrants. A joint study of the Migrant Resource Centre of South Australia and Adelaide University. O’Dwyer, Monica (2011). “Participation and employment: A survey of newly arrived migrants and refugees in Melbourne. Research and Policy Unit, AMES.” https://www.ames.net.au/files/file/Research/AMEP%20Survey%20Results_Final%20%282011%29%281%29.pdf. OECD (2015). “How will the refugee surge affect the European economy?” Migration Policy Debates No.8. https://www.oecd.org/migration/How-will-the-refugee-surge-affect-the-European-economy.pdf. Parsons, Richard (2013). Assessing the economic contribution of refugees in Australia. Brisbane: Multicultural Development Association. https://mdaltd.org.au/building-connections/assessing-the-economic-contribution-of-refugees-in-australia/. Paterson, Tony (2015, 15th December). “Angela Merkel vows to ‘tangibly reduce’ refugee numbers – gets seven-minute standing ovation from party”, The Independent. https://www.independent.co.uk/news/world/europe/angela-merkel-vows-to-tangibly-reduce-refugee-numbers-at-party-conference-and-gets-seven-minute-a6773121.html. Productivity Commission (2006, April). Economic impacts of migration and population growth. Final Report. Canberra: Commonwealth of Australia. https://www.pc.gov.au/__data/assets/pdf_file/0006/9438/migrationandpopulation.pdf. Provost, Claire (2012, 8-14 February). “Bringing it all back home”, The Guardian Weekly, p. 14. Refugee Council of Australia (RCOA) (2010). Economic, civic and social contributions of refugees and humanitarian entrants: A literature review. Report for the Department of Immigration and Citizenship. Canberra: Commonwealth of Australia. Ruist, Joakim (2016, 28th January). “Fiscal cost of refugees in Europe,” VOX – CEPR’s Policy Portal. https://www.voxeu.org/article/fiscal-cost-refugees-europe. Sheehan, Paul (2015, 27th September). “Pope talks of hard choices, but who pays for them?” The Age. https://www.theage.com.au/comment/pope-talks-of-hard-choices-but-who-pays-for-them-20150927-gjvzkq.html. Stevenson, Rob (2005). “Refugees and economic contributions”, Hopes fulfilled, or dreams shattered? From resettlement to settlement – Responding to the needs of new and emerging refugee communities conference, University of New South Wales, Sydney, 23-28 November. Stilwell, Frank (2003). ”Refugees in a region: Afghans in Young, NSW,” Urban Policy and Research, 21(3), pp. 235-248. https://www.tandfonline.com/doi/abs/10.1080/0811114032000113635. United Nations (1948). “The Universal Declaration of Human Rights.” https://www.un.org/en/universal-declaration-human-rights/. Zetter, Roger (2012, December). “Are refugees an economic burden or benefit?” Forced Migration Review, 41. https://www.fmreview.org/preventing/zetter.html. Dr Richard Parsons is an independent social researcher and a Senior Associate with the Australian Centre for Corporate Social Responsibility. He specialises in helping organisations to navigate complex stakeholder relationships in dynamic environments. He is the author of Assessing the economic contribution of refugees in Australia, prepared for the Multicultural Development Association.